When a decades old toy breaks down and stops working with no hope of repair, you usually just toss it or find some way to recycle the parts. But what if you're as attached to that toy as you were a pet? 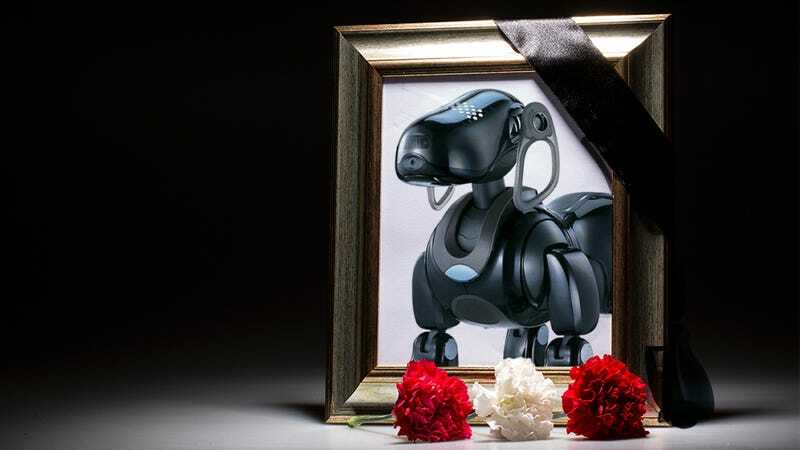 In Japan, people are giving Sony's robot AIBO dog actual funerals to say goodbye to their faithful, electronic companions. Originally introduced way back in 1999, Sony's AIBO—or Artificial Intelligence roBOt—went on to sell well over 150,000 units, despite a price tag well north of $2,000. And up until March of last year, Sony provided repair services for the robots that were packed full of electronics like sensors, cameras, and servos that made them behave remarkably lifelike. Smaller companies have since popped up offering to continue to repair broken AIBOs, but replacement parts are getting scarce and the robot dogs are starting to break down in greater numbers. In other words, the artificial breed is starting to die off. So when it's determined that a broken AIBO is beyond repair, it's scavenged for parts to help revive another AIBO who might still have a few years of companionship left in it. But not before the robot dog's owner gives it a proper send off. Last month, at a 450-year-old Buddhist temple in Isumi, outside Toyko, a small collection of dead AIBO's were given a proper Japanese-style funeral, complete with tags showing where the pets came from and who they belonged to.